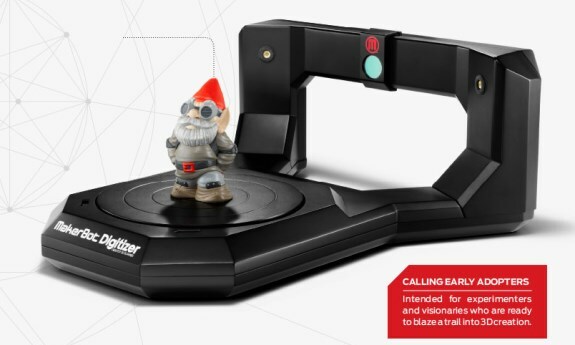 MakerBot introduces the Digitizer, an upcoming desktop 3D scanner that promises to make 3D scanning easier and more affordable than ever. The device is only suitable for the scanning of relatively small objects though, the maximum size it 8" x 8" (203.2mm x 203.2mm) and the spinning turntable where the item being scanned sits on can support a weight of up to 6.6lbs (2.99kg). The entire scanning process takes about 12 minutes and promises to be accurate to within 2.0mm. Perhaps one of the most important things about the device is that it will likely lead to an explosive growth of freely available content in the 3D ecosystem. MakerBot is offering the Digitizer for pre-order at $1,400 with an optional $150 service plan. Availability is expected by October. The device looks a bit like an old record player with a spinning turntable where the item being scanned sits. An armature attached to the turntable houses two lasers which essentially act as rangefinders as the object spins around. They track the curves and lines of the entire surface, eventually recording hundreds of thousands of points in three dimensions. The MakerWare software suite takes all those points and assembles a digital mesh, ready for printing.>/blockquote> Full details at ExtremeTech.